Pastor Jacques Nignan has been the Director of the GRN work there since its official beginning in 1998, although many recordings were made before then. There are currently five full time staff and four volunteers. Each Wednesday the team fasts and prays for the ministry in their country. They have a great heart to make the Good News of Jesus available in recorded form to the many unreached and non-reading people of their country. 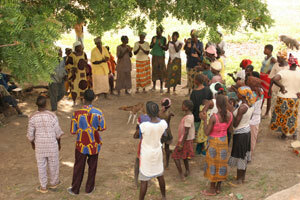 They also pray for the surrounding countries of Cote d'Ivoire, Mali, and Niger. 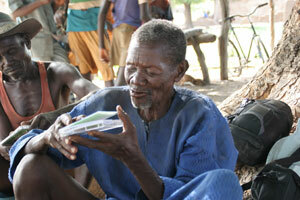 So far recordings have been made in about 83 languages in Burkina Faso, 79 in Cote d'Ivoire, 43 in Mali and 38 in Niger. But there are many languages that remain unrecorded, and many of the recorded languages need more material. 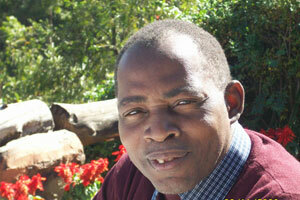 Distribution, outreach and follow-up are done in partnership with local churches and mission groups. In the church at Bika there was a young lady who had been disturbing the church for several years. Whenever she came to church she would cause others to leave, many of whom never came back. The pastor had prayed for her many times but with no apparent effect. One day the GRN team visited that church to be involved in friendship evangelism. The young woman was there but suddenly it seemed that she could not bear the presence of the Holy Spirit. She started crying out, confessing that she had never been a good Christian and that she had driven many out of the church. She started asking God for forgiveness. As we prayed for her, the Lord brought her deliverance, and as a result many others who knew her in the village also gave their lives to God. 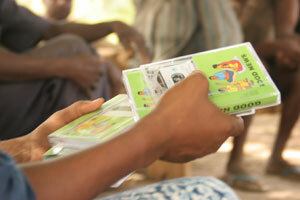 During an outreach in another village, the local chief sent us messages to stop showing the film. He complained we were making too much noise. The next day, we felt prompted by the Holy Spirit to go to the chief and give him a copy of "The Good News" and several other cassettes in his own language. He called his people together to listen to them, then on the next day he sent people to our office asking us to come back with more cassettes and more films! We went back and he told us to keep on doing our work because it was very important for his people. Now there is a church of 100 people in that village, where before there was none. In one village there was a woman known locally as "The cannibal of people's souls". She came to our meeting with the intent to cause trouble. We showed a film about a woman with the same name, and amazingly the woman in the film was just like this local woman. In the film, the woman came to Christ after someone prayed for her. The film frightened the local woman and with a loud cry she ran up to the pastors and asked for prayer, confessing the terrible things she had been doing for many years. After prayer, the woman vomited about 20 litres of liquid. The next day many came in secret to give their lives to Jesus. Burkina Faso is a landlocked, drought and famine prone country on the edge of the Sahara in West Africa. It was formerly known as Upper Volta when it was a French Territory. Burkina Faso means "The land of upright people". 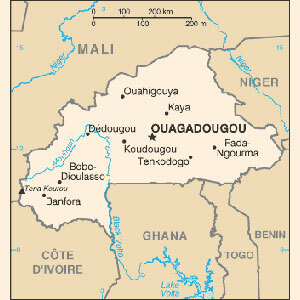 Its capital is Ouagadougou (pronounced waagadoogoo)! Burkina Faso is a poor country with a life expectancy of less than 50 years, high infant mortality and high HIV AIDS incidence. About half of the 15.2 million people are Muslim, about 40% have indigenous beliefs and 10% are Christian. French is the official language with an estimated 150-200 languages and dialects spoken there. The official literacy rate is about 20- 25%, although such figures are often over-estimated. 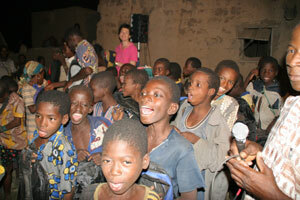 Praise God for what He is doing in Burkina Faso and pray that many more will find deliverance and freedom. Pray for the GRN team as they continue to make the Good News of Jesus available to each people group in their own language and as they encourage and train local believers in outreach ministry. After the floods in Ouagadougou in August, Jacques wrote, "...Two of the staff lost their homes. The office was flooded by 1.5 meters of water. Most of our important documents and ministry resources were under water... We lost the roof of our house and water came in and destroyed the rice, corn flour and important papers. We have many people who lost their homes who are coming to us for help too. Please pray for us."